Oregon became a state February 14, 1859, the 33rd state admitted to the Union. William Willson filed plats in 1850 for the main part of the city, and suggested the name Salem as an Anglicized version of the word “Shalom.” David Leslie, President of the town’s Trustees, suggested using the last five letters of “Jerusalem.” Leslie was educated in Salem, Massachusetts, which also may have influenced his suggestion. 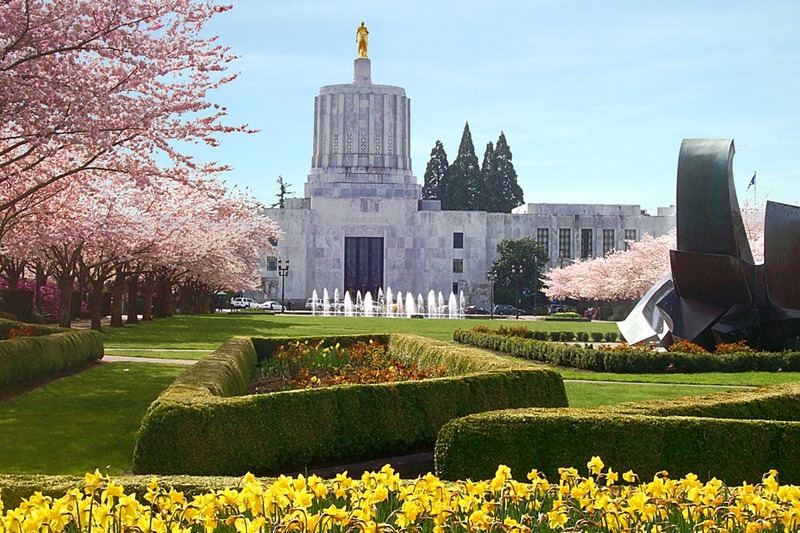 The gold-leafed bronze statue on top of Oregon’s capitol symbolizes the rugged pioneers who carved Oregon out of the wilderness. But the building, completed in 1938, is a modern Greek-Art Deco design, matched by four more state buildings in Capitol Mall. On the grounds are many statuary and monuments. Salem is in the beautiful Willamette Valley; Willamette University, the oldest institution of higher learning west of the Missouri River, is here too; on campus visit many historic buildings and the Mark Hatfield Library. At Mission Mill Village fleece is turned into fabric in the Woolen Mill Museum; several parsonages interpret missionary family life of the 1800’s. Deepwood Estate and the Bush House are authentic Victorian mansions open for tours; Honeywood Winery is Oregon’s oldest producing winery. The freshness of the air, the farms surrounding everything, the milk, the cheese, the golden-hearted people there, the independent spirit of the pioneers, the love of place. The rhodies everywhere you look. Mountains near: Cascade Mountains, Coast Range. Mount Hood in the northern part of the state is the highest point in Oregon at 11,249 feet.